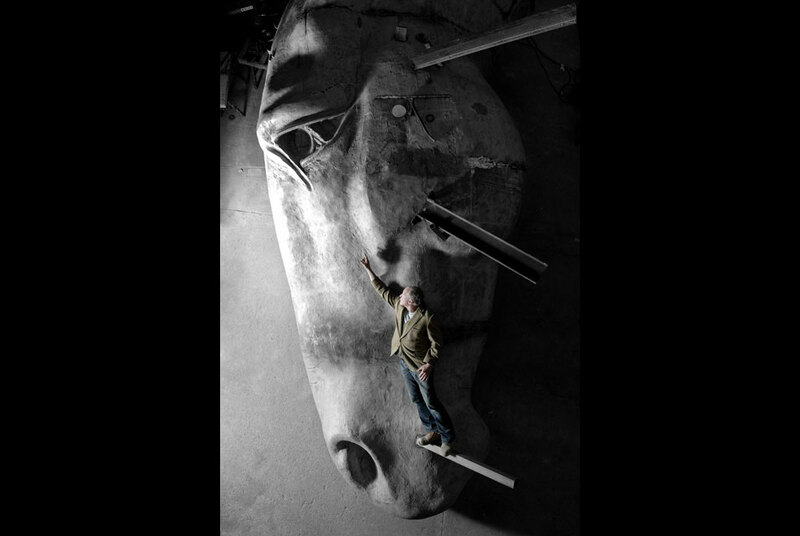 This 33ft high bronze Horses Head has taken a year to build. LONDON.- Londoners near Marble Arch on the evening of Tuesday, September 14, 2010 will witness the installation and unveiling of a brand new public work of art by highly collectable and contemporary monumental equine sculptor Nic Fiddian-Green. This 33ft high bronze Horses Head has taken a year to build, weighs 17 tonnes and will be the tallest free standing permanent bronze in the capital. Understandably the road will have to be closed for its delivery. It was made specifically for the site at Marble Arch and replaces an earlier piece temporarily installed last summer that was originally commissioned by Sir Anthony and Lady Bamford and is now leaving for their Daylesford estate in Gloucestershire. This summer Nic Fiddian-Greens work has been well-received at Glyndebourne, Royal Ascot and more latterly Goodwood, where a monumental Greek Head was shown on the Trundle hill on the South Downs above Goodwood racecourse overlooking the sea, before moving to the racecourse for Glorious Goodwood. Westminster City Council has been instrumental and supportive in the planning process to start creating a more beautiful London according to Boris Johnsons vision and in time for the approaching 2012 Olympics.